Podkoren is a very pretty mountain village with lovely alpine architecture set around an attractive square with excellent restaurant just 2km from Kranjska Gora, Slovenia's best known mountain resort. 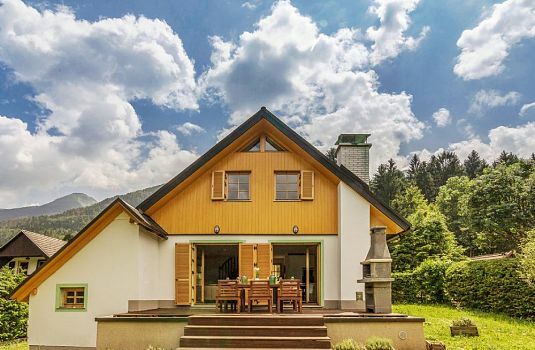 Hisa Miha is locted a couple of minutes walk to the centre of the village and 3 minutes walk (400m) to the Podkoren side of the Kranjska Gora ski pisteson the junction of the road running from Kranjska Gora to the Italian border and the turn off to the ski slopes. The house is oriented away from the road towards a wonderfulviews of the World Cup Ski Pistes and Julian Alps. Not many Kranjska Gora chalets offer the opportunity for guests to watch the annual World Cup races from the comfort of their own balcony! On the border with Austria & Italy, Kranjska Gora is the most famous mountain resort in Slovenia. The skiing is the main draw for many people – Kranjska Gora Ski Resort is a superb resort for families and beginner – intermediate level skiers, with pistes easily accessible from Podkoren or the Kranjska Gora side and a range of other winter sports in proximity - cross country skiing, sled dog tours, ice climbing, ski mountaineering & ice skating. With stunning mountain scenery, great access to the Triglav National Park and a host of summer outdoor pursuits it remains very popular all year round. Lake Jasna, a short walk out of the centre of Kranjska Gora offers a stunning place to swim and sunbathe in beautiful mountain scenery. There is a wide range of other ski areas in Slovenia / Italy / Austria within day trip distance from the property. Please click here for a map / guide to these resorts. Walking is one of the main summer attractions with a huge range of beautiful trails to suit all abilities. Running through Podkoren just a few hundred metres from the holiday rental chalet is also a wonderful cycling trail on an old railway track runs 30km from the bottom of the Upper Sava Valley into Italy. A 10 minute walk from the chalet is one of Kranjska Gora's most famous attractions - the beautiful Zelenci nature reserve. Just a few minutes drive on the Italian side of the border circa 15 minutes drive from the house are the stunning Belopeski Lakes (or Laghi di Fusine in Italian). A wonderful place for a walk and to admire the views up to mighty Mangart mountain, which lies half in Italy and half in Slovenia. There is also a huge range of mountain biking in the region including a World Cup mountain bike park on the Kranjska Gora ski slopes. There is also a Summer Sledging piste on the ski slopes which is very popular with kids. The town of Kranjska Gora itself is a pretty alpine affair, very family friendly, with lots of lively restaurants, bars and a couple of swimming pools / spas. Around Kranjska Gora are a number of extremely pretty villages (including Podkoren, Ratece, Mojstrana, Dovje) in idyllic mountain surroundings. There is a regular daily bus service between Podkoren and Kranjska Gora, great for getting to the ski slopes in Kranjska Gora or you can walk to the slopes and ski over. In Podkoren there are the harder World Cup pistes and some easier beginner pistes. 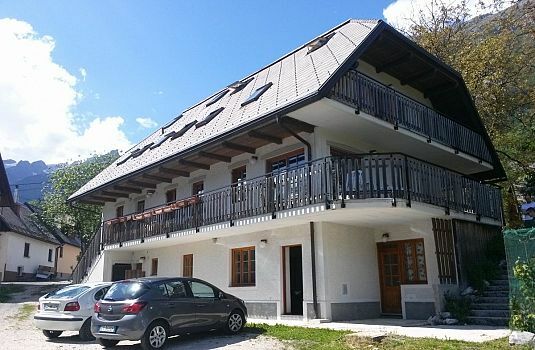 Hisa Miha is an excellently appointed, spacious, comfortable, bright, Kranjska Gora holiday rental chalet, fully renovated in 2018, offering two independent units ("The Apartment" sleeping 4 and "The House" sleeping 8) with separate external entrances and an internal staircase with door at each end, meaning the two units can be opened up and joined together for groups wanting to rent the whole chalet (5 bedrooms, 3 bathrooms, 4 WCs in total). A small garden (garden seating & table available) and parking area lead to 3 exterior doors. In one is the common ski storage area. The second, down a few steps, leads to a spacious ground floor 1 bedroom holiday rental apartment with generous, well appointed kitchen, open plan with the living and dining area. Leading off the living area is a large bedroom ("the beige room" with twin single beds which can be pushed together to make a double) and in the other direction a quality bathroom with walk in shower and bath and separate WC. The third exterior entrance to the house is up a few steps and leads to a large open plan living room / kitchen / dining room. On this floor is also a double bedroom ("the blue room") and a spacious bathroom with bath and walk in shower and separate WC. Upstairs is a further bathroom with walk in shower and separate toilet, plus three bedrooms: the master double bedroom ("the grey room"), the second double bedroom ("the green room") - both with access to the beautiful balcony, where you can sit and enjoy the magnificent alpine views and from where you can also catch the action on the Podkoren World Cup ski slopes. The final (white) bedroom offers twin single beds. The fit out is great quality and considerable thought has gone into guest comfort with excellent kitchen facilities, generous sized double beds, USB ports in bedrooms for phone charging, high quality linens and feather duvets . There is multi-lingual cable TV and wifi throughout the chalet. 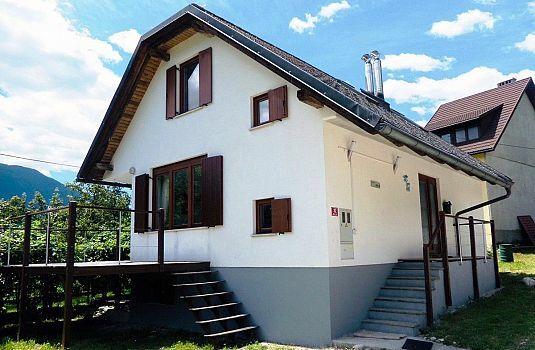 A perfect rental chalet for your Kranjska Gora holiday in Summer or Winter. USB ports in all bedrooms for phone charging. Double beds are generously sized. Bed linens are high quality with feather duvets. No. of bathrooms 3 (The Apartment - 1, The House - 2). In addition there is a separate WC in the apartment and two separate WCs in The House. Bathroom fittings are high quality throughout. Hob, oven, fridge, dishwasher, washing machine, freezer, toaster, kettle. Garden / outside space Circa 100 m2 including parking area for communal use by all guests. Outdoor table and chairs available for guests. The House also has a large balcony on the top floor. Accessible for disabled No - steps up / down to each unit. Ski storage room available for all guests on communal basis. A refundable security deposit of 200 EUR/apartment is payable for this property. 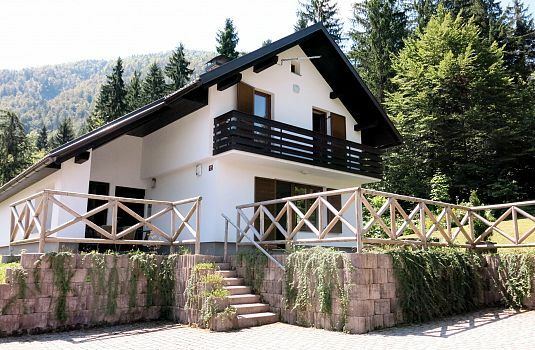 Hisa Miha is a comfortable and spacious holiday rental with great mountain views, fully renovated in 2018, in walking distance to ski pistes in wonderful Podkoren village 2km from Kranjska Gora. The chalet comprises two independent units with their own entrances (an internal doorway / staircase which can be opened up between them to create a single unit). On the ground floor is a generous 1 bedroom apartment, sleeping up to 4. The upper floors comprise a spacious bright open plan living room / kitchen / dining room, 4 comfortable bedrooms, lovely balcony with views & 2 bathrooms. Outside is a parking area & small garden, plus communal ski storage room. Located just 400m from the World Cup ski pistes at Podkoren which connect to the main Kranjska Gora ski resort. It is a similar distance to the centre of lovely Podkoren village and to the Jesenice to Tarvisio cycling trail, it is 10 minutes walk to Zelenci nature reserve and 20 minutes walk to Kranjska Gora itself where there are a host of excellent tourist amenities, unforgettable hiking, biking, magical alpine scenery and a small lake.